We’re now a little over a month into the New Year, however, we’re firm believers it’s never too late to better yourself and perfect your New Year’s Resolutions. Amongst all the resolutions to go the gym, eat better, and read more books, why don’t more people add a goal to live their life a little more sustainably with the start of each new year? Since my time in college, my commitment to sustainability has only increased. I made efforts to learn the recycling rules inside and out, carry around a reusable mug, and choose foods that would lower my footprint. I understand that starting a quest towards living a more sustainable life can seem daunting, however, I’m here to provide you with some tips towards reaching your sustainability resolutions for 2019. Our campus has become extremely reusable friendly, making it the perfect place to get yourself involved in long lasting habits. With filtered water stations located throughout campus, it’s both faster and cheaper to fill up your own bottle rather than purchase plastic bottles throughout campus. In addition to water bottles, reusable mugs for coffee and tea can be used throughout any coffee location on campus as well as the dining halls. With the new recycling rules, none of the Starbucks or single use coffee cups are recyclable, creating an insurmountable amount of waste that will fill up landfills and take an extremely long time to degrade. Using a reusable mug offers a discount and a punch on the reusable mug card. If you’re in a hurry, there is a new Tapingo option to order coffee and tea at Starbucks to “skip the line” and get your drink right away! If you’re an avid Keurig user, they also make reusable pods that you can fill with your own coffee grounds, eliminating the waste from the individual K-cups. I will be the first to admit. I’m not vegetarian or vegan, no matter how much I strive to be. However, that doesn’t mean that I need to eat meat with every meal! I make a conscious effort to avoid eating meat in at least one meal a day, and usually go entirely meat free at least 2 days a week! Vegetables use significantly less water and resources to produce than meat and dairy products, so by eating more of them you are eating more environmentally friendly. Additionally, our campus offers a plethora of locally sourced foods, and to support this initiative I choose to eat the meals containing locally sourced ingredients. My last tip is instead of purchasing frozen dinners, fill up a clamshell at the dining hall for an easy to heat up meal for later. You’ll save on the money, on the packaging, and will allow you to take home any “leftovers” you may have put on the dish tray that would have otherwise been wasted. I love exploring the city of Rochester and experiencing new restaurants, but many restaurants produce extreme amounts of waste. By considering restaurants sustainable initiatives you can select locations that align with your environmental values. For example, Red Fern, a vegan restaurant located on Park Ave, focuses on leading their businesses sustainably. You can also control how you get to many of these locations. The orange line that transports students to and from Eastman is able to be stopped along the way to get around Rochester, as well Eastman school being only about 1 mile from Park Ave and many other locations. By choosing the bus and walking instead of taking an Uber or driving, you once again save money and the environment! Although making changes in a comfortable way of life can seem daunting, beginning with small changes can end up adding up to create a big impact. By pledging to make these changes in the New Year, you can look back at your progress month by month. 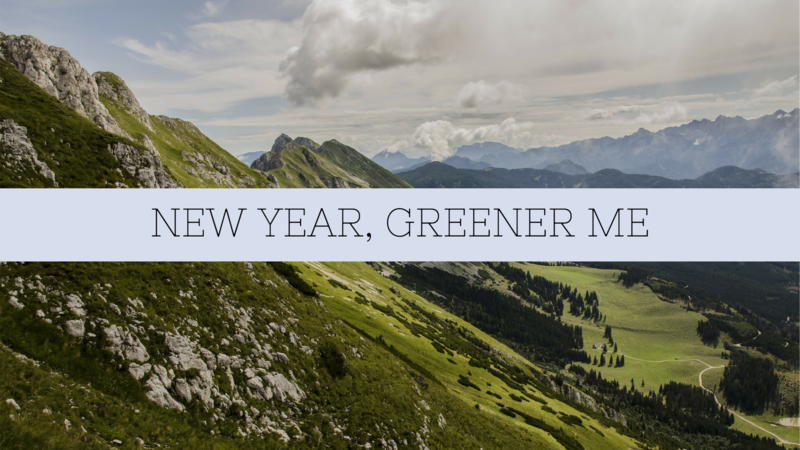 What are your environmental New Year’s Resolutions? We’d love to hear them!